From the treestand to the tundra, the Men's Catalyst Softshell Jacket changes the paradigm of technical hunting softshell jackets. Silent, breathable, insulating, and engineered to stretch and move with you, the Catalyst changes what is possible in a softshell jacket. The revolutionary, 2-layer construction creates a jacket that is warm and breathable while also being lightweight and completely silent. Interior 37.5 fleece lining works to optimize your body temperature while the brushed, durable exterior is ultra-silent while fending off moisture through our advanced DWR. The result is an ultra-versatile jacket that performs as well in the stand as it does in the backcountry. 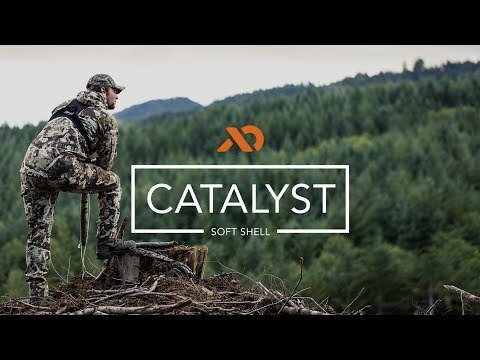 Whether you are looking for silent warmth sitting for whitetails during the rut or hoofing it through knee-deep snow on the trail of late season elk, the Catalyst softshell system will help you get it done. The Catalyst is also available in a Men's Pant. I really want to LOVE this jacket and I am close to that, however there are a few design flaws that hold it back from GREAT for me. 1 - like the sawtooth this jacket runs very short. Being a tall skinny guy, it is a tough fit. If I get a large its way to big in the chest but actually long enough. if I get my size in Medium it is almost to short in the waist and in the arms but perfect in the chest. Wish they had tall sizes or made the length in line with some of the original style jackets. 2 - the bottom pockets are really narrow and lack depth. They are hard to get your hands in due to how narrow the opening is and they are pretty short on depth with makes them not very useful. Having said that I still wear it a good bit especially in early turkey and deer seasons. Nice and warm without being to hot and repels enough water to make it a great piece IMO. odd fit. chest size runs big but arms and length run small. Got this jacket for bowhunting in the fall and I couldn't be happier. Its athletic fit is just right for drawing and shooting my bow without interference. The DWR finish is helpful on those misty/drizzly days where water beads off nicely. Gotta get a second one for those times when the Mrs wants to spend a night on the town and insists I leave the camo home. I can still fly the FL flag though! I would like to see this jacket in black. Coming from a heavy alpine climbing back ground I was glad to see a thinner approach to a soft shell jacket compared to other brands offerings. The thinner material aids in greater articulation and movement. While not sacrificing any thermal retention or wind cutting properties. In fact of all the Softshells I have used even non hunting brands for climbing high altitude mountains, the Catalyst is top notch for refusing any wind to get through. Water resistance is great as well, definitely takes some solid time in a wet forrest to begin to bleed through. Yet the breathability is above anything else I have ever used. Sleeves are perfect for archery hunts and hands down one of the quietest outer materials of any jacket on the market. I am still getting used to how tall the collar is. However it is a god send when the snow starts in side ways and it’s time to through the hood on and zip up. To sum it up, weather compared to other Hunting Softshell jackets or non hunting brands, this is up there as one of the best executions I have ever owned. Highly recommend from Western, Whitetail, Waterfowl to other recreational sports such as alpine climbing to sking. Fit is great, medium fits me perfect with the ability to still layer some. Sleeves get a tad tight over extra layers, yet as stretchy as the material is it does not hinder movement. I prefer it this way due to its tapered sleeve cut for my predominantly archery hunts. I used this jacket this past fall for hunting whitetails in Illinois and it is the perfect weight. Using a merino base keeps you comfortable in a wide range of temperatures. Once it got into the 20s and below I’d have my Woodbury jacket in the pack to put on once I started cooling off. Definitely a very versatile jacket. I also used it in January in Arizona on a mule deer hunt which we seen below normal temps and a lot of snow. The DWR performed great and kept me dry and warm. I received this jacket during July 18. I have used it almost all of fall and winter. It has good features and I like the jacket, however I would like to see some improvements. You really have to wear some type of wind break underneath to help ease the blowing wind here in CO or the prairie. I wore a 400 weight merino base layer and had to go to a light windproof jacket/vest underneath. Please do more than DWR or at least have the fabric well treated with DWR. Snow is not too bad but the rain is a problem. Please add a dual front zipper system. Having the ability to zip from the bottom up helps prevent bunching up while seated in a blind or tree stand. Pit Zips are a must if you're going to compete with the other top two brands. I know the 2019 stuff will be out soon but please consider these improvements for the 2020/2021 season. Keeping it real. 6'4", 230#, 40" waist, 37" sleeves. XXL fits well with enough room for a thick merino base layer and a windproof light jacket or windproof vest. This jacket could not fit me any better. From the top of the hood to the bottom it’s perfect. Absolutely quiet and a MASSIVE improvement over the older soft shell. The older soft shell seemed like a hybrid between a rain jacket and soft shell doing neither particularly well. This jacket is much lighter, but much more prone to soaking but it does what I would expect for a soft shell, light insulation and weather resistance in a comfortable quiet layer. My only complaint is that the original DWR coating was either missed or ineffective. The jacket never really beaded water and was very prone to staining. Aftermarket coatings has helped but they are quick.to wear off. Overall, I am happy with this jacket as a cold weather piece. I wore it during the unseasonably cold 2018 1st rifle and 4th rifle seasons in Colorado. I hunt in a heavily forested area of Colorado. My hunting usually consists of a lot of hiking with plenty of uphill. It is often precipitating; rain, snow and snow falling off trees. I am happy with the weight, warmth, comfort, quietness and DWR finish. My main gripe with this jacket and other First Lite pieces is the lack of pit zips in the jackets(and zip venting in pants). The jacket does breath reasonably well, but often it would be very useful to have pit zips to dump extra heat. I always have a pack, a bino harness and an orange vest on, so venting with the main zipper is not always sufficient. This is a good jacket, but please please please add pit zips! Sizing for tops is usually a little tricky for me. I'm 5'9 and a little bulky up top with big shoulders, arms and chest. This jacket is a little too roomy for me and a bit long in the sleeves, but I feel the length is perfect. I feel if I wore a medium, it would be too short, but fit well everywhere else. This jacket is dead silent, and very comfortable. Makes it perfect for those September Elk hunts! It holds close to the body and moves with you, everything an archery hunter likes. I can't wait to get this jacket into the field. The sleeves are small in diameter so its perfect for holding any under garments out of the way of the bow string. With the smaller diameter sleeves comes a little less space for thick jackets or multiple layers (if this is your outter-most layer) but none the less, plenty room for long sleeve shirts or thermals. Or if it's really cold out, grab a vest to wear under it, as the body is larger so no problems there. Picked this up as a versatile first piece and hoped for just enough lightness, warmth and water protection. Ended up seeing some snowfall on our scouting trip and the jacket worked great with my FL base layers and tag cuff beanie. Recommend. Fit me well. I might prefer the body fit of a M, but the sleeves on the L were just right. Wasn't baggy or anything, just my preference to be tighter in torso, but it is a jacket. I really liked this jacket and used it as an outer layer by itself or also as a outer layer that I wore over the Uncompahgre puffy jacket. It worked very well both ways. I did mostly stand hunting this year, but I will also use it in spot and stalk out west in the future. My Uncompahgre seemed to be sized a little bigger than the Catalyst softshell. My Uncompahgre is a size large and seems roomier. For the Catalyst, I needed to go with a XL and that fit well over the puffy. I finally got the chance to put this to use today. Southern Arizona is known for its temperature swings this time of year and that's what happened today, Started out glassing with 55 degrees and sunny but windy but the storm clouds moved in and it almost instantly dropped to about 42 with a 20 mph wind. The 150 hoody and Kiln QZ were fine while it was warmer but when it dropped I put on the Catalyst and it did a really great job. I felt the wind but didn't notice any chill at all and there's no doubt I could have easily withstood a few more degrees colder with this jacket before I would have needed to go with a heavier option. The only thing I don't love is how tight the sleeves fit around the forearms and wrists. It was really tough to wear my wrist buckle release comfortably with this jacket but it was in no way a deal breaker. Just something I have to work around a little. Overall this jacket is an excellent piece for those mid range temperature. I've read a few reviews criticizing its performance in the wind but I didn't find this to be the case in any way. Due to my height and length I wear XL in base and mid layers but had to go with 2XL in the Catalyst. The draw strings at the bottom pull the jacket in so it doesn't feel like it is too big in the body. Tried every brand in existance. Every compnay has a niche, but First Lite is SUPERIOR clothing. Plain and simple. This jacket was one of my main go to pieces this deer season. It is very versatile. I wore it from 50 degrees down to the mid 20's. I was able to layer under with no problem. When I wore it in the mid 20's I only was hunting the last hour of the day and was very comfortable but if I had to sit all day I would have used the sanctuary system. The soft shell is ultra quiet and is very water resistant. Incredibly comfortable. The shooters cut is great for drawing a bow! My sleeve is clear of the string and I never have to wear anything to hold back the sleeve. This is jacket is perfect for mid/ into late season jacket. I’m located in TN so the cold is not to the extremes but I wore this jacket out of the box with a T-shirt and thin fleece underneath in 30F from 5am to 10am and stayed warm. Coming from upper Midwest in Michigan I’ve delt with extreme cold weather. If you are looking for a jacket in that sense I look into the sanctuary jacket. But for everything else the Catalyst is literally the best hunting jacket I’ve owned over the last 15 years. Not to mention the Stealth! Is extremely quiet and you just disappear. You know it works when you are surrounded in every direction including down wind from 12 Whitetails. I used this for the cool mornings for elk, and mid season for whitetail in Maine. Which mid session mornings can be cold, but with a puffy underneath, you can get a lot out of this jacket. Bout as quiet as you can get, without being wool or fleece. Packs up pretty small so you can carry it easy. I usually wear a large, abs the arms are just a little long. I'm 5'9, 195, with a muscular build. This is a really nifty, lightweight, quiet, durable, bow hunting jacket. I see myself using this it down to about 40 degrees, stationary. The sleeves are cut SLIM. You won’t have to worry about mishaps with your bow string, but it will limit the amount of insulation you can wear under the catalyst. I can barely fit a base layer and the cirrus puffy, due to the sleeves. There is however, adequate torso room for a vest. I think an ideal set up would be base layer, mid layer, vest, and catalyst. Either order a size up, or be prepared to layer only a vest under it. The hood is unlike any jacket I’ve owned. It really gives you great neck and face coverage. I’ll be glad to have it in the cold, but dont plan on using a kisser button with the hood fully zipped up. It seems very durable. I don’t see it suffering from any structural damage, post brush busting. I used the Catalyst in a whitetail hunt for a week and it met with wide and varied conditions. The first day was about 40 degrees and raining and i simply wore an aerowool next to skin, the kiln midlayer and the catalyst softshell and i was warm and dry. The next 2 days were snowing and in the 20’s and i simply added the cirrus jacket between the kiln and catalyst. By Saturday it was 50 and clear, so i was back to what i started with as far as layering. A good portion of the hunting consisted of breaking brush and monofloral rose (briars) and the jacket never snagged or frayed. The water repellency was excellent. I love the cut of the cuffs as it keeps material from bunching. The midsection is cut a bit big for me but the drawstrings on the bottom of the jacket allow for somewhat of a size adjustment. The sizing is consistent with my other items for layering. The material utilized is quiet when moving. Overall i would highly recommend the catalyst. Fit seems to be exact, with the cut being consistent with other items of the same size in the layering system. The sleeve cut are a plus, the midsections a little bit bulky but nothing clownish. Man I love this jacket. Have been wearing it all gun season here in NY. Pretty bomb proof through the brush which surprised me. DWR works great the few times I've worn it in the rain. If it does get wet, it dries quickly. Love the athletic fit through the arms, feels technical and well thought out by the company. I'll end up buying another to wear around town for sure. Love it!! Large is spot on for me. I've had mine out on a couple of excursions now. The first was a fishing trip where the morning started out in the 20s and the temps quickly climbed into the 50s. The Catalyst perfomed wonderfully especially when we were motoring up or down river and I needed to cut the wind. This jacket isn't windproof (a necessary byproduct of how breathable it is), but when you are appropriately layered it doesn't matter. I've also had it out on a duck hunt where the temps started in the single digits and rose to the 30s before I was finished. I wore the Catalyst the whole time while adjusting a layer or two below it and stayed comfortable while activley jump shooting birds on the river. I normally wear a large, but opted for an XL because I wanted to be able to put my Uncompahgre underneath it. I bought this to wear as a windbreaker over my tech fleece and merino. It is a softshell. Supposed to block the wind. I switched back to my hard shell outer wear half way through my trip. Central alaska gets cold in the am but warms rapidly. I found if I was moving with the jacket on I was fine. But any stopping and the wind started cutting. Overall I liked the jacket. Just wish it cut the wind a little better. Fit was good. Fits like the klamath but shorter. I used this product along with the catalyst pants on a 6 day Montana Elk hunt. Temperatures ranged from 20 degrees to 40 degrees. Heavy snow fall on the first two days and winds up to 30 miles per hour in spots. This product performed flawlessly. It held off the wind well and repelled the snow. The only time I got cold was when I was glassing for more than 30 minutes in the wind. Otherwise while moving it kept me warm and comfortable. I’d recommend the product for spot and stalk. Great Jacket! It does what it claims! The sleeves are very snug and hard to put on over layers! One cannot wear a watch and hope to access the watch as the sleeves are too small. In fact, one day, I was wearing a watch and several layers and my hand started to go numb due to the tight fit of the sleeves! I do not have "Popeye" forearms! Finally got to break out this jacket because the temps plummeted last weekend of bow season. Somewhere between the ATV and the stand I realized I was not making any noise walking despite the fact I was moving in a hurry. After this discovery I paid more attention and varied the tempo of my pace. Quiet. I had a solid sit that day and whatever slight movements I made in the stand were met with silence from the products I was wearing. I was comfortable the whole time in lieu of the colder than usual temps and most importantly, quiet to and from and while in the stand. I was very excited to try this jacket and pant out. I am very open minded and have wore many high end brands. I did my research looking for a great all season shell I could layer and use for the whitetail rut in the midwest. I wanted to like this gear so bad as I love the color and fit. The gear did absolutely nothing to stop wind and in my opinion is its main job. The little rain I got on my hunts were soaked into this gear like it was cotton, rain soaked through as soon as it hit the garment. I understand this isnt a rain jacket but its advertised to repeal and it certainly does not. It also tore very easy. I have 3 holes in this gear from an 8 day trip, I would rate durability a 2. Here is my entire system I wore and was still getting killed by a 15mph wind. Catalyst soft shell jacket and pant, thin merino next to skin, 400g merino mid layer and insulator vest and pant from another manufacturer which has proven itself 10x over. I was freezing in no time. This shell is closer to early season getup. Very disappointed. I will say fit, style, color is thought out but that wont keep me on stand longer. This jacket is the bomb dot com. I loved the north branch but wish it had a few changes, then first lite releases the catalyst and all of my wishes came true. The chest pockets are a great addition and perfect for a cell phone or range finder. The hood, like all others in the line, is excellent. It stays in place and allows free movement of your head and neck. And you want to talk about quiet, it is almost as quiet as a fleece layer, or a mouse fart. Take your pick. I've worn this starting in late October when temps drop to 50 over a base layer to take the chill off, and when layered with a klamath and uncompaghre, this jacket will take you down below freezing with ease in a stand. This jacket has quickly risen to my top pieces of gear, right up there with the guide pants. You won't be dissatisfied with this system! Shooters cut is perfect and good length in the torso and sleeves, great if you are tall and have long arms. Order your normal size and you can layer without being bulky or compressing too much. I have been using this jacket primarily for treestand whitetail hunting , I think it would be a little on the warm side for archery elk, at least here in NM. Just like with the pants, I have been very pleased with the performance. The fabric is quiet, DWR works and the wind resistance is good. I wear this down to the 40s and the Woodbury takes over after that. The pocket layout is very good, plenty of storage. I don't mind the hood not being detachable, it stays out of the way for the most part when I'm not wearing it. The one thing I can't figure out is why First Lite didn't include a safety harness pass through like with the Woodbury. This is a great multi-season bowhunting jacket and it just seems like that would have been a no-brainer. Anyways, don't that let deter you, I am glad I bought it. I seem to be a right in the middle of Medium and Large on First Lite's jacket scale since I have some of both. With this one I had to go large just like with the Sawtooth. The medium fit well everywhere except the shoulders where it was a bit tight. I love this jacket. I have used it on three hunts so far and it is by far the most versatile piece I own. It keeps me warm in low temps and I can easily layer warm gear under neither when the temps drop further. It also repels water far better than I expected. The catalyst jacket overall is a great piece of outerwear, both comfortable and extremely quiet. During my late October mule deer hunt in northwest Colorado with my father, the jacket did an excellent job curtailing the wind which was bitter cold...great jacket and works as advertised! My only issue with the jacket is the sleeve cuffs. They seem to be pretty tight. While putting the jacket on, the sleeve cuffs had the tendency to bunch up my other layers and did not allow me to comfortably wear a watch. Minor blemish and I would not hesitate to buy this jacket or recommend it! Sleeve cuffs were tight (probably okay for somebody with smaller forearms). This jacket is great. I beat some haevy manzanita brush in this thing and it came out without a thing out of place. It holds heat in well, its light, it dries out quickly, and the pockets are placed nicely. I absolutely recommend this jacket. The only places I could see some improvements are these; a longer tail of the jacket so it doesn't slide above your waist line when you sit, and to add armpit vents. Then BAM, perfect late summer, early winter garment. I've been searching for a do-it-all outer layer and this jacket fit the bill. First wear was on opening day of pheasant. Started off ~50F and windy. Shed a bunch of briars, stick-ums, and thorns. Layered with Wick crew for an active, brush beating hunt. Stayed warm, not clammy, and shed the wind. Temp quickly dropped to mid 30s, heavy sleet and wind the pelted our faces. Zipped up the turret hood and was able to wait it out and "Stay Longer"! The jacket also held up on stationary bow hunts and alternating active/stationary fly fishing trips. Layered with Wick, Kiln Hoodie, and a light puffy to go between 30-60F and intermittent showers. Genuinely impressed with this jacket. Fit is spot on. Shooter's cut is great in shoulders/arms. Just enough room in torso to layer up with light puffy or just run a next-to-skin layer without being too baggy. I have a stocky build. I ordered this in L to fit over the Uncompahgre vest which I ordered in M. I loved the combination. The jacket is quiet and was just heavy enough to keep my warm for an 11 day September back country archery hunt in CO. I was excited for this coat to arrive and get right in the outdoors with it the material is unbelievable quiet when walking in thicket and pulling back your bow its definitely a versatile piece, I’ve had layers underneath for chilly mornings and could move very well in the jacket. I wore this on a late October hunt in Colorado. Temps were low 20s at night and low 50s and sunny during the day with alittle snow. I wore this almost the entire time. It breathed good while hiking and kept me really warm while sitting and glassing (with a light puffy underneath). Really quiet while stalking and surprisingly very water resistant. Coming with me on every hunt! Fits great. I went with a size up so I could layer underneath. I am 5’11” 220 lbs athletic build and went with an XL. Love this new addition to my kit! Used it in the end of early to mid season Elk in NW Colorado and it is a sweet balance between nice and warm while we sit ( a little shorter than a long glass session) but not too hot while walking. If we were on the go during midday it's a little warm but not excessive and has a nice balance of breathe-ability while blocking wind and keeping light rain and snow out with the DWR. I am a fan of the beautifully versatile jacket I now have in the arsenal! Sleeves are a little bit snug in the forearm region, BUT that is great for archery and also keeps the sleeves out of the way in general. Wore it with a llano+kiln underneath when the temps really dropped and it was great. I only opted for the uncompahgre when the temps were dropping into the single digits and sit and wait time rolled around. Excellent product. Got caught in the rain with Catalyst jacket and pants and only got damp. And it was really raining. Quite and comfortable pieces. Great when paired with a good base layer. Would recommend looking into this set to everyone. I am 5 10 220 and usually go XL with all First Lite gear. It fits me perfect. Used the coat this opening weekend and loved it. Perfect temp for the humid mornings and dry cold evenings. The 37.5 works, have it in a snowboarding jacket and trust it fully. Material seems durable and quiet for pushing through brush or belly crawling. Feel like it needs to be about 1-2inches longer for my taste but the arm/measurements were spot on for full rang of motion and comfort. Purchased for spot and stalk mule deer in SD. Could not be happier with warmth, rain/wind resistance, and durability. I ordered a large and it fits well over my base layers and puffy vest and doesn't feel bulky. Sleeves are tight from mid fore arm to wrist with 150 and 250 weight base layers on at the same time. Fit is perfect once it's on, but I can't really be stealthy about putting it on, and have to take off gloves and my release. Outstanding jacket. Took it for a northern Idaho elk hunt with the assumption of using it early in the morning and later in the evening when it cooled off. This became my go to jacket. Plenty warm for the mornings, evenings and long static glassing sessions. Had no issues packing it down nice and small so it didn’t take up real estate in my pack. Super quiet and extremely comfortable. I’m 5’9, 235lbs. Went with the XL and fit was perfect. Plenty of room underneath for thin base layers but not baggy with only a shirt underneath. I can't wait to try this jacket out. I ordered the XL and it was a little shorter and tighter in the arms than I would like, so I ordered it in a XXL and it fits perfect. There is a draw string around the bottom so you can tighten up the excess. The only negative I can say is that I really with it had a slit for a safety harness. I may take it to a tailor and get one put in. I should be able to hunt for most of the season here in NC with this jacket and a couple layers. I have an XL in the Woodbury and it fits great, but I had to size up to a XXL for the Catalyst. The XL Catalyst was too short in the body. Wanted a lightweight coat that was quiet and comfortable. Its damn near silent! I love the fusion camo and cant wait to use it this season. This coat will compliment my kanab pants. I am a athletic/sub 16; 5K runner, and I am in between a M and L with most shirt sizes. I am 5-10 and weigh 160. I ordered the medium and I couldn't be happier. I prefer tighter clothing than looser. Fit is very form fitting and I tried it on with a poly pro baselayer as well as a thin lightweight wool sweater and its perfect. I also own the brimmed hat and the combo is fantastic. The sleeves are tight so if you are looking for form fitting this is it. I am very impressed with this year's softshell material. I like it better than the North Branch material. This jacket is very warm, especially for the weight. Its what I'd call a mid-weight jacket. I originally ordered a L, which I wear in almost all FL tops, and while it fit OK, it was a bit tight in the shoulders, and I was only able to get maybe one layer underneath. So I swapped it for an XL, and it is going to be much better. Sleeves aren't really any longer, and it will allow for a couple of layers and likely a vest underneath. This should get me down into the 30's with it now. Overall, I'd highly recommend as probably the most versatile jacket FL makes. A bit smaller than most other FL pieces I own. I'd go one up on this one, especially if you want to layer some. used for high country elk and mule deer. I put on a lot of miles when hunting and constantly change for temp regulation. This jacket performed well. However, I think it would be difficult to wear anything beside thin baselayers under it. The forearm area is tight and restrictive to thicker underjackets. Awesome piece to add your kit. It's incredibly quiet for a softshell. Normally you have that scratchy sound with them, not with this jacket. Outer shell seems to be super durable. I'll be putting it through the ringer the next couple months. Zippers are top notch, the turret hood fits perfectly on the head as well. Little longer in the back than front.Really like how arms are more form fitting on the jacket with the archer in mind. First lite really thought about the hunter with this one, it's just a great all around jacket. Talked with first lite representative on sizing and they really helped out. Fit was spot on. Finally got to wear it..35 degree temp had on 250 killn top and bottom with my 1/4 zip aero wool,winds were out of NE at 6 only thing got chilly on my was my nosesnd I’m a stand hunter..it stops the wind and d## I luv how quite and much free movement you got..now I’m getting cold nature the older I get I would say if it drops much below freezing I’ll prolly go with my furnace has my first layer. Very awesome jacket which has replaced my old North Branch Jacket. Very versatile piece, I have worn down into the low 40's with a few layers underneath. Also, have sat in the rain and stayed completely dry. Highly recommend for early season, spot and stalk, etc. as it does seem to shed moisture and is a very quiet material. 5'11" 170 lbs and fits perfect! We went mule deer and elk hunting last week which the temperatures ranged from 35-85. The wind was howling every morning and the jacket kept it out very well. This jacket could withstand worse temperatures and can't wait to take it out again. It fit a little tight with two layers underneath, however it worked great in many different conditions. I would get a size up if you want a puffy jacket underneath it. I recently got this piece for a WY pronghorn hunt. I had on an old Llano base, the Klamath hoodie and this Catalyst. If I was doing anything other that sitting, this combo would have been TOO warm! I mean that in the best possible way! The weather was a mix of freezing drizzle, wind and fog, and while sitting and glassing, I could not have been more comfortable! Fit was PERFECT for me! Great with or without under-layers. This jacket is amazing. Hunting elk in northern Utah had crazy weather swings this year. From 80* down to freezing. This jacket became my work horse. The jacket was supper quite and well built. My first time out w/ the the Catalyst was tonight. Deployed into 56 degrees and humid. Mosquitos in northern IL are horrendous right now. The fabric prevented getting bitten and with a net over my hat, I was bug proof. Despite being a little heavy for the temp and walking in, I found my sweat evaporated within 20-30 minutes in my stand. Very quiet material. As comfortable as pajamas. 6’0”, 200lbs, size large here. If you plan on layering heavy under you may want to size up if in between sizes. This jacket was perfect for my mid September Mule deer hunt in the Eastern Sierra Mountains. Morning temperatures were in the mid 20's and late morning got up to almost 60 and I was perfectly comfortable with the Catalyst and a long sleeve shirt on underneath. The jacket was incredibly comfortable, the pockets are all in the right places, and it kept the wind from coming through. This one will always be making the cut when I pack for future hunts. The small fit nicely. I'm 5'7" 145 pounds athletically built. I love this jacket! Its warm and thin at the same time. I havent got to use it because its still crazy hot where I'm at, but I'm looking forward to cooler temps. This will be one of my go to pieces in the late fall and early winter in the South. It fits great. Slightly loose, but not bad. I normally wear a large and maybe could do a medium with a thin layer underneath, but I like the large for if I want multiple layers under it. This is a great outerlayer jacket to block wind. I didn't get to test it in rain on my hunt but used it on some breezy days and it worked perfect. While myself and another guy (wearing a different brand camo) were up chasing goats on a hill, the boys at camp were watching us through their binos. While they could pick up my partner fairly well they said even through binos they could barely make me out. I was using the FL Fusion pattern. When wearing the softshell alone it was a little big but I ordered a large to put it over my insulated uncompahgre puffy and it fit great. Just got the Catalyst Jacket in the mail and I am pretty pleased. It was SUPER quiet and pretty light weight for a soft-shell piece. I am a tree stand hunter and was looking for that mid season jacket that would be able to buck the wind. I can see this jacket being a great piece for mid season tree stand hunts as well as late season back country hunts out west. I am 6'3" and 170 lbs and the large fits great. The sleeves are plenty long. For me the torso is cut just below my belt line. I did order this in fusion and conifer so I could have one to wear around the town! Extremely comfortable jacket. I ordered this jacket for mid to late season hunts and it works great. Blocks the wind while glassing and keeps the warmth in. Haven't been exposed to rain so not sure how it will hold up. The material is flexible in all directions and extremely quiet. This jacket is slim in the forearm area. So if you have popeye forearms it will be snug. Fits true to size every where else. This jacket is by far quieter than any soft shell jacket I own from the competitors. I love the lightweight application, while still providing great warmth when used with the FL baselayers. I used this for long horseback rides with temps ranging from high 30's to mid 40's. Also, I used it for sits longer than 30 minutes when the temps were in the 40's to low 50's. My only suggestion is to please add pit zip vents, and this would be a perfect 5 stars. Lastly, the FL Fusion camo pattern is perfect for both my whitetail woods and western mountain hunts! A little more loose than I'd like to see it in the stomach area. While I cannot yet speak to the in-field use of the jacket, I have to say that this jacket is the most comfortable jacket I have ever worn for just casual use prior to hunting season. The jacket is very warm for being such a thin jacket. I have shot my bow with this jacket on several times and can attest to the "shooters cut" and the ease of motion. I am 6'0" and 188 pounds. Jacket fits perfect. When you add a well thought out design with quality materials and workmanship the sum total can add up to an awesome product. The Catalyst Jacket exemplifies such a product. I haven't used this yet as the PA season is just around the corner, but its clear this jacket will be with on many occasions. In fact, I believe this jacket will work straight through to late muzzleloader season. I am not a fan of hoods on a jacket, However, I know on one rainy day I'll be happy to have it. It would be awesome if the hood was detachable. And I do mean detachable and not rolled up in to the collar. Either way, I am still going to wear this jacket a lot. Thanks guys. Fits well. As with most of your products I am always right between two sizes, mostly because of a big belly. So its either a little loose or a little snug. But neither in a bad way. I received the Catalyst Softshell Jacket (Fusion) just in time for a bear hunt in Matachewan, Ontario this year. I wore this jacket over the Chama mid-weight merino base layer and was very comfortable sitting still in the low 50's. It also rained on me 3 of 7 days and this jacket was basically waterproof - it never downright poured, but I sat through a light steady drizzle for 4+ hours on multiple occasions. The most notable feature is that the jacket is super quiet. It's very comfortable to wear over a t-shirt as well. Very impressive quality and performance. I recently got this jacket and love it! Having a lot of experience in mountaineering gear, I am very picky with my softshell jackets. This jacket has it all; just enough insulation for chilly mornings but not too much to exclude it from early archery kits, great wind protection, a great DWR to bead light rain, a solid hood, and a great feel and quiet exterior. I can't wait to get the pants now! I do have to add, I would have appreciated pit zips, but the jacket breaths well enough that I can keep it on and not wet it out. I'm extremely excited to run this jacket this fall. While it is advertised mostly as a stand jacket, it definitely has a place for any type of hunting or outdoor activity. It's quiet, maneuverable, breathable, and is the perfect weight for any fall hunt. I never really liked softshells until this jacket. First Lite hit a home run with the catalyst system in my opinion. Just added this jacket to my Firstlite kit and I love it. It is incredibly comfortable and quiet, yet durable. Will be giving it a test in the CO wilderness chasing elk this season. Most of the time it will be used hunting whitetail in Missouri. Got this for turkey and early deer season,this will be my go to jacket for ever,it fits snug but but you could do anything in this,work,draw back on big boy with ease,a person could workout in this thing,idk but I think I may use it has a layering piece. First thoughts when trying the jacket on for the first time- the outer face fabric is great...quietest soft shell I've ever had! Also very comfortable jacket! Great collar design, and like other FL jackets, I love the wrist cuff design. Things Id like to see different- when I first put my hands in the pockets it had a "cheap" feeling to me. The net, or mesh like material in the pockets doesnt feel good. This may have been used due to being very light and breathable material but maybe if it was a softer, slightly thicker material it would be better...just my opinion. I bought this jacket this year (obviously) and didn't think I'd be able to use it until early to mid fall. We were lucky enough to have a decent cold front come through over the last week and I was able to get out during the peak of it to chase some speed goats. When I left the truck, the thermometer read 45 degrees. Since I was bowhunting, I was concerned about the noise it might make. However, those fears were pretty quickly forgotten as it was incredibly silent. It also has the perfect amount of insulation built into the jacket for that type of temperature. While I know it isn't a rain shell, it still performed quite well with the little bit of drizzle that was falling during that hunt. We're back up into the 80's, now, so I don't think I'll get to put it on for a few more weeks. I'm definitely looking forward to getting it back out into the field, though, because that'll mean the season is in full-swing. Great jacket. It cuts the wind well and I love how it zips all the way up, giving the hood a snug fit that keeps the wind and weather out. It is a well designed jacket but pit zips would be a useful addition. Where to start? This jacket was very well thought out. Elastic waist drawstrings in the pockets to keep them out of the way and allow you to seal out drafts without exposing your hands. Fitted elastic cuffs to seal out drafts. Balaclava-like turret hood with an elastic drawstring to fit the hood to your head. Incredibly lightweight. I wouldn't want to stand in the shower or ride out a downpour in it, but I held my arm under my kitchen sink on full blast and the water flew off like they were magnetic polar opposites. Very good range of motion, but the sleeves are free of any unnecessary material. If you're a softshell guy, this is your jacket. Exactly what I was looking for. Not baggy as a standalone, but enough room for a base and possible two mid layers underneath. I have not been able to use in the field yet as it just came out, but I have been using it on morning hikes or range sessions. I'd say temps are still a bit warm for the need of a softshell, but the jacket seems to breathe better than other softshells I've used in the past, especially without pit-zips. The face does seem considerably quieter than other jackets and looking forward to this being my outer layer for November, hopefully not December, white tail hunts. However, if I have to go into December, because of how I've built my kit, it'll work great in my system. Fit well, if not a little snug do to slightly athletic cut. I tried XL version as well but felt I was swimming in it. Snug fit is more in arms than body. I was recently on a 12-day photography trip in Alaska where the weather was unpredictable to say the least! We had everything from 30 degree clear mornings, or pouring rain, a light drizzle, and even snow. The Catalyst Softshell was the perfect outer layer to keep me warm, and more importantly dry because we all know the animals will be out there rain or shine, therefore I needed to be ready for any conditions. This piece of gear is a must! This is my first experience with a jacket from First Lite and it fits very well. It is a well made jacket that looks like it will hold up well to the elements. The only thing I wasn’t real impressed with were the mess pocket liners. These seem to be cheap option for such a well made jacket. I only recently purchased this jacket but the fit is fairly close to what I expected. I bought it as an outer layer and fits great over my insulating layers. Slightly large when worn on its own but I suppose that’s to be expected. I like how quiet it seems to be. Elk season starts in a few days so It’ll be tested soon! I am 6’ 185lb and I ordered a large. Fits good over a down jacket. Medium might be tight over the down layer. I cannot wait to put this jacket through the paces this fall. While it's mostly advertised as a jacket for stand hunting, I'm excited to take it into the mountains this year. Its extremely quiet, breathes better than expected for a softshell, and the maneuverability is great. To me its the perfect weight for an all around jacket not too bulky and not too thin. The Catalyst system is impressively breathable and water resistant. For Softshell jackets, the fabric is more quiet than a mouse fart. The jacket seems like it is going to be right at home in the mid season whitetail stand. Very light weight and very quiet. I ordered a large and the fit is spot on but if you are going to layer very many things under this jacket go a size up. This is the perfect mid weight outer layer. Will work as well in the treestand as it will spot and stalk on the ground. Quietest offering yet, but still cuts wind really well. This is rapidly becoming one of my main go to pieces of gear. 2XL fits perfect on my big frame! Great temperature regulation and super quiet. Everything I wanted for Minnesots bowhunting. Not too tight. Allows for layering. Great fit. So quiet. Great movement with a bow. Highly recommend. Short version: get this jacket and the catalyst pants! Just the right insulation for an early season hunt and they will be great in the mid to late season over a base layer and under a shell for harsher cold spells. Long version: Took these out on an Elk scout in the Canadian Rocky Mountains last week getting ready for opening day of Bow Season. First impressions it fits really well. I’d call it an “athletic fit”. I’m 5’11” 190lbs (a bit stocky). I don’t have huge shoulders (measure 45” around shoulders and 42” around chest and wore the Large). Hiked two long ridges and kept moving all day. Had the Kiln hoody underneath and really only had to wear this jacket when I stopped for longer glassing sessions. I don’t feel restricted when wearing it over a hoody and a t-shirt under that. Did a little target shooting with all the layers and a bino harness and Day pack on - still felt very mobile. Had a bit of cool alpine wind in our face while on a bare ridge and the jacket cut the wind great. Didn’t face a whole lot of rain in it yet, but a light drizzle wicked right off it. I wore the Large. I’m 5’11” 190 lbs. shoulders are 45” around and chest is 42” around. Fit was perfect for two snug fitting base layers underneath. The temp so far has been 40 degrees in the morning high country elk hunts. This jacket has been perfect over my 150 base layer. Quiet, fits perfectly and packs down in my day pack easily. Oh, and the pattern has hidden me from sight. My hunting partner has tagged out. Just need an opportunity myself to complete the season comfortably in my firstlite gear. The catalyst set is much thinner than I anticipated. The fleece liner is a very lightweight fleece without much loft. I am skeptical that they will perform well below 50F without a puffy layer or multiple baselayers. That being said I sized up the jacket and it fits like a dream. I have a comprable softshell from a mountaineering company and love the turret hood with the drawstring around the top of the skull. Allows you to cinch down the hoody and has a built in visor for when the weather turns uglier. Sleeve length is perfect and I can comfortably layer a fuse top, furnace top, and uncompahgre vest underneath without any binding or restriction in movement. I am also glad they went with a stretchy material around the wrists versus adjustable cuffs made of velcro or some other snap. I think this will be a good early-to-mid season jacket, but will have to add extra layers or transition to insulated outwear once it gets below 50F. The fit is true to size, so size up if you plan on layering underneath. I am XL in plainclothes and ordered the 2XL and it allows me to comfortably fit many layers underneath. This coat has a superb fit and is ultra comfortable. I use mine for midwest whitetail hunts and is very warm while still light weight. Tougher than the puffys and much quieter. This will be my go to coat all fall. I’ve been searching for an outer layer that was both longbow and compound friendly. Most other brands have a lot of extra material in the forearm area, and I found myself having to use an arm guard to tuck it out of the way. With this jacket, there is none of that but it leaves room if you wanted to pair it with a puffy vest. The material is very quiet and judging by my unscientific test of sticking my arm out the window of my truck going 60mph, it should buck the wind fairly well too. I love this jacket! Cuts the wind just enough while remaining breathable. There is no movement restriction in the shoulders which is amazing for a soft shell, and it just feels great to wear. I was a little disappointed that the forearms are as tight as they are. Layering even my Sawtooth is almost to tight for comfort in the forearm area. If you plan to wear any under layers I would size up for sure. I wish I would have. Just a little to articulate in the forearms. I had asked a rep about that specifically because I was a little concerned that this was cut too tight like the KUIU Guide DCS. He assured me that a light down sweater underneath would be fine and to stick with my regular size of a medium. Unfortunately not so. Jacket preformed great for caribou season in white mountains. Warm and quiet at 43 degrees with mid wt base. Did well under Seak lite rain shell for an all day soaker as well. Fit well for 6’5” 200lb with athletic build. I’m very impressed with this jacket. It fits perfectly and the quality is second to none! I highly recommend purchasing this jacket it’s awesome! I ordered a medium and large. The large was good in the shoulders but really baggy in the mid section. length was good. The medium was too tight in the shoulders but good in the mid section and too short. Neither fits perfect but I sent the medium back and am sticking with the Large. I wish it fit better, but i'll keep it for now. It is very comfortable and stretchy. Maybe better for rifle than bow because of the fit. Also, the collar at the neck does not fold down easily and may get in the way. Time will tell. I like it. Great combination of fleece to this jacket. No more worries about getting wet and cold during my northern Idaho fall hunts in the rain and snow. Was back in forth with this product and the Woodbury. Decided to go with this for layering purposes. Have not got to try this product out yet. Waiting for the upcoming archery season and gun season here in Ohio and Pennsylvania. I previously reviewed this item. My review has this jacket as four stars. It’s definitley a five star jacket. Must have thumbed the button on my phone on the first review. The purpose of the piece is to be my one and done camo outer layer for when I'm hunting things other than upland birds. I got a size large so that I can layer other clothing under it when it gets cold duck hunting or turkey hunting early in the year. I like how quiet the jacket is and the fit on the arms is quite nice - but there is a decent amount of room in the jacket for a beer gut. I am an athletic guy and this disappoints me a bit but the functionality of the piece isn't compromised. I’ve only owned one other soft shell, an old Ibex. The Catalyst is much quieter than the Ibex. The stretch is really nice. The hood articulates well when I turn my head, but it zips a little high for my taste. Pockets are placed well - I like the depth of the hand pockets because even if you leave them unzipped it’s difficult for items to fall out. Haven’t tried it out in the rain yet but will soon here in the PNW. It kept me comfortable on my 4-day backpacking trip in central Idaho last month. I’m 5’8” and thin. The arm length is spot on, it’s a little tight around the hands when taking it off. The torso area is slightly roomier than I like on its own but when I layer other insulation underneath it all functions really well. I love this jacket so much I just ordered another on in the Cipher color! Purchased this jacket for the upcoming season. It was delivered as expected and after opening the box I was pleasantly impressed. The jacket fits well with the cut being bow perfect. Good stretch in the arm and shoulders allowing for easy draws on my bow. With no noticeable sound during the process I will be able to find success in the woods this season. Can’t wait to get into the woods to put it to the final test. This jacket fits great and you can tell the quality as soon as you put it on. I am looking forward to wearing this when the weather gets cold in the stand and also duck hunting in the swamp. This is a great piece to layer underneath to make it more versatile. This jacket is an excellent light to mid weight type jacket for the earlier parts of deer season. In early November in Virginia, it can start off pretty cold but get on up to the 50s and 60s during the day, and this jacket will match those temperatures very well. It's fit is great as well as its right over athletic: fairly close but enough to allow a light sweater underneath with good range of motion. I'm super excited for those temps to drop so I can get this thing in the field. The fit is perfect! I tried jacket on an just standing still, could feel it warm me up. This jacket will be my go to piece! Fit was great, I'm 6'7" and had plenty of length in sleeves and torso. This jacket seems to be very durable, yet also very flexible and quiet. Anxious to see how it does in colder weather! Plenty length in the sleeves for a big and tall guy without being to baggy everywhere else. Looking forward to wearing this jacket all season. The jacket is very silent, comfortable, and warm. The jacket is put together very well. Slightly baggy wearing it by itself, but works well with layers underneath. Great jacket! Fits perfect and material is so quiet compared to the competitor jacket I’m replacing. Can’t wait to test it in the field. Sizing is perfect. Order your common size. I’m loving the fit of this jacket, athletic form fitt but has a lot of movement. Also has a nice soft yet durable exterior, quiet too. Perfect addition to my collection. I have had a few softshell jackets and this one makes the least noise and of the bunch, bunches up the least. The sleeves taper well and don’t get in the way of the bow string. The hood fits just right and does not bug my face when it’s closed up. Some jacket hoods poke inwards at the top of the zipper near your mouth and they feel like theyre trying to find their way into your digestive tract but not this one. Nice and comfy. The fusion pattern looks great in it. Can’t wait to put it to hard use. It fits me perfect. Not boxy, great sleeves. Perfect length. Not too long, not too short. Another one nailed! Awesome jacket. Fit is great and it designed so well. Love the pockets. Great early to mid season jacket for Indiana. Only complaint is I wished it had a slit in the back for a harness but not a big deal at all. I’m athletic\muscular build and fit is perfect even in the shoulders and arms. This jacket is super quiet! I can't get over how silent it is, and how warm it is. It has a nice little stretch to it for drawing back a bow. The pockets are awesome and the zippers are even silent. This is going to be my go to outer layer for whitetail hunts from late September through December. I got a small in the jacket which will allow me to have the fuse crew and a chama or kiln on underneath. I didn't want it to be too baggy or long in the sleeves, and I couldn't be happier with the fit. I haven't used this for hunting yet since I just got it but I'm very happy with the quality. Overall feel it has good quality and the zipper feels sturdy. This jacket is awesome, super lightweight and comfy for a soft shell. Love the way this jacket is laid out as far as fit to body and pocket placement, It’s a must have for the firstlite collection. Tried out my catalyst soft shell the other day and completely loved it. Quiet, light, and the perfect fit. I couldn’t be happier with this coat. Awesome jacket and so comfortable and quiet. Fits perfectly and is true to size. This jacket is phenomenal! When combined with the catalyst pants you have a dead ringer. The warmth this jacket provides helps ease the burden of packing extra gear. You can navigate the woods quietly and access your pockets without fear of making too much noise. This jacket will definitely help you go further and stay longer. Im fairly barrel chested so i ordered an XL. The jacket fits perfectly and i enjoy the back bottom seam. The cut allows you to navigate the thick stuff with out worrying about what's going down your six. This jacket is incredible. It has great stretch and is light but durable and warm. I ordered a large and the fit is perfect for my build, however if I was wanting to put multiple layers or bulky insulation underneath I would need an XL. I am looking forward to wearing this in the deer stand when the weather cools off and also in the early duck season in the swamp. Received the Catalyst Top and Bottoms in the mail a few weeks ago. Fit and finish is excellent. The whole setup makes perfect sense. Like they say, it is deadly silent. It keeps you warm but breathes exceptionally well. Have worn it in the field scouting thus far. Extremely versatile piece of kit. Highly recommended. Can't wait for fall to get here so I can put this to use. All the features of this jacket will fall in perfectly for white tail tree stand hunting. Quiet, comfortable hood that is out of the way when not needed, the right amount of and properly located pockets, drop cut back, man this thing is well laid out. Here is where First Lite really shines for me. I have never had outdoor clothing that fit properly. Standing 6'6" with an athletic build everything I have ever owned has been too short or too tight. I was hesitant at first ordering my first piece of gear from them. But the sizing (2xl) was right on. Sleeves are long enough, pants touch the floor, and there is enough room to layer if needed. First Lite you have a customer for life!! I received my FL Catalyst Softshell Jacket today and cannot wait for cold weather. I have several FL hunting clothing items. I have been wearing their products for a few years now. That being said, I also have some of their competitor's hunt clothing as well. I figure I know a little bit about hunting in the cold and inclement weather, durability and most of all keeping me warm and dry. This jacket is a hit for sure (with me anyways). The jacket has soft fabric (not stiff or fabric with a hard hand feel). This jacket will definitely allow me to comfortably wear one or two layers of undergarments, depending on the base layer fabric weight. I really like the three point hood adjustments. The hood moves with your head, not like some that your head moves within the hood. I like the button mechanism sewn into the jacket that allows for the hood cord to relax which makes it easy to pull the hood back. The jacket has a drop down back to adequately cover your backside and a cinch cord for adjusting the bottom waist hem. Another feature I like, it does not have a wrist adjustment strap and that aggravating velcro that always seems to stick or attach itself to other clothing, namely merino wool or polyester. Matter of fact, this jacket does not have any velcro. The wrist cuffs have this unique inner half wrist elastic that fits snugly and comfortable around your wrist. I purchased the Conifer color which allows me to hunt, but also doubles for other outdoor or casual activities (even wear to work, etc). Seriously, there is nothing about this jacket I do not like. Compared to the competition, it is priced right and I will have to give this jacket a tick or two higher in points than KU or Si (if you know who I mean). For size comparison, FL hit the mark with sizing and fit (with me anyways). I am 6',4", 225-230#, 40" waist and wear a 37" (+) sleeve length. Size XXL fits me perfectly. After years of using a competitor’s line of hunting clothes, I made the switch to team firstlite. I could not be more happy so far. The material quality, workmanship and pattern technology are top notch. Because this, I will continue to add more firstlite products to my arsenal. Probably the most impressive part of the product to me, in addition to the fabric, was the fit and cut of the garments. I felt unencumbered by a restrictive fit or by extra /unneeded material. As an archery hunter, This is my biggest concern when choosing hunting clothing. Bravo firstlite! This jacket is awesome! Really comfortable, and really quiet. I'll be getting the pants when I can. Bummed I didn't have this for Turkey season but glad I have it now! This fit has been the best so far of my FL gear. I haven't had a chance to try it out in the field yet but my expectations are high. This is a high quality piece and every aspect seemed to be considered in design. It's light and fits well. I think it will be very durable and super quiet. Lots of room in the upper arms and shoulders. It's longer than I expected. Both are positives for me. I am not a soft-shell fan. They do not typically have the temperature range to justify bringing on the mountain. Meaning you end up packing the jacket more than wearing it. The Catalyst is the only soft shell i've been able to wear for the majority of the day the breathability far surpasses anything I've worn. That said, I would be the first to tell you our previous softshell was less than perfect. It was stiff and the fabric made a bit of noise when rubbed together. The Catalyst fits well and is damn near silent. I used the proto whitetail hunting in the mid to late Season (30 - 50 F) where I grew up in Maryland and it did great. Given this piece is also more breathable than its predecessor, I think I may also use it on late season elk and deer day hunts here in Idaho. Runs a bit large. I am a medium in the majority of FL gear but a large in this jacket. In other words, I would size up if on a seam between sizes. For reference, I also wear a large in a casual tee. I asked on chat for a great jacket and I got it! First Lite hit a home run with the Catalyst Jacket. Incredibly quiet and seems to be very durable. Would be great for a spot and stalk day trip or sitting in a tree stand. I'll be getting the pants ASAP. Man, this thing is breathable, lightweight, and quiet. Given, I just received it today, but I run pretty hot, and even though I don't have a/c, this thing breathes really well. Was a high of about 85 where I'm at in Southern California, with at least 60% humidity, upon putting the Catalyst jacket on, it breathes really well. It doesn't seem like its windproof, standing in front of a fan on high, I could feel about 10%-20% of the fan through the jacket zipped up with just a t-shirt underneath, but then again with other layers like this jacket is meant to be used with, you could make it as toasty as you wanted it, at least in my neck of the woods. I can see this jacket being great down to freezing with proper layering. I've got some weight to lose, but the jacket fits great. If I were 10lbs heavier I would go with the XXL. I wear an XXL in FL baselayer sizes, but an XL in the Cirrus. My belly and chest are 50", but I wear 40" pants (XL in Obsidian). As another review mentioned, the only place the jacket felt tight was around my forearms, they weren't too tight by any means, but if you're forearms are bigger than 14" and you're looking at the XL, consider sizing up. I'm in the process of losing weight, but I feel I could easily wear a thicker baselayer, as well as another layer under the jacket at this point if I really wanted to cook. The way I see it, the more weight I lose, the more I can layer under it. Compared to the North Branch this jacket is really light weight and super quiet. It's almost unbelievable how quiet and light weight it is. The conifer looks real sharp and will double as a great jacket to wear on non hunting adventures. I look forward to trying this in the tree stand this fall. Since I just recently received this coat, I don't have any use-based comments. Just my "out of the box" thoughts. In terms of quality and function, I'm really going to love this piece. It fills a much needed spot in my gear kit. I don't think it will be particularly warm as a stand alone piece. I'm guessing it will work perfectly for cool to cold temps with proper layering. For those wondering what size to order, my experience might be of help. I'm 6'1" and weigh approx. 185 lbs. Based on these 2 dimensions, I was encouraged to buy a large. Large ended up being a bit too small for me. It fit, but would bind in the elbows and shoulder blade area if I extended my arms. On top of that, a large left me no room for layering. I reordered in size XL and absolutely love the fit! I think a large was too small based on the way my frame is configured. I have relatively slender legs, but broad shoulders (I have a flat stomach, so that's not the issue). Based on my experience, if you have broad shoulders (or perhaps a muscular upper body) I'd recommend trying a size XL first. Overall a great coat...as with all First Lite products I own, you won't be disappointed! This piece is my go to for everything from midseason tree stand sits during the midwest whitetail rut to late season mountain hunts in the west. This piece is silent, breathable, durable, and water resistant...perfection! Can't wait to use this in the fall. Fit is on point and they weren't lying when they said it was silent. Pretty amazing coat.